This is a a living version of our sons avatar hutjip. We handmade the hands, torso, shoulders, legs, and head by cutting and painting pieces of cardboard and plastic shapes. 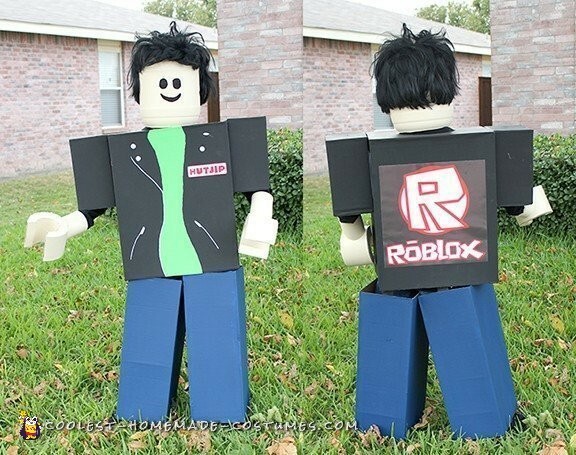 The torso reflects the black jacket and green shirt over jeans of the avatar he created in the Roblox game. The head features mesh covered holes that allow him to see and move freely and the jeans are strapped over the shoulders like suspenders so he can walk and move in a jerky manner like the game movement.